For my birthday last year my family gave me some money. I had requested this monetary help to go towards an Ipad, or similar electronic tablet. I researched numerous options and scurried to the mall to purchase my present from the family. I looked and looked , and debated with myself about all the options available. Three hours later I returned home with five birdfeeders. You see, I reasoned that I may not in fact like the electronic tablet. I use my laptop consistently and already know it quite well. I can carry it on trips and even take it to the front porch where I can enjoy the flowers and all the birds… if I only had birdfeeders with which to attract the birds. (Logical transition, right?) This is why I veered from the Apple store to the hardware store. 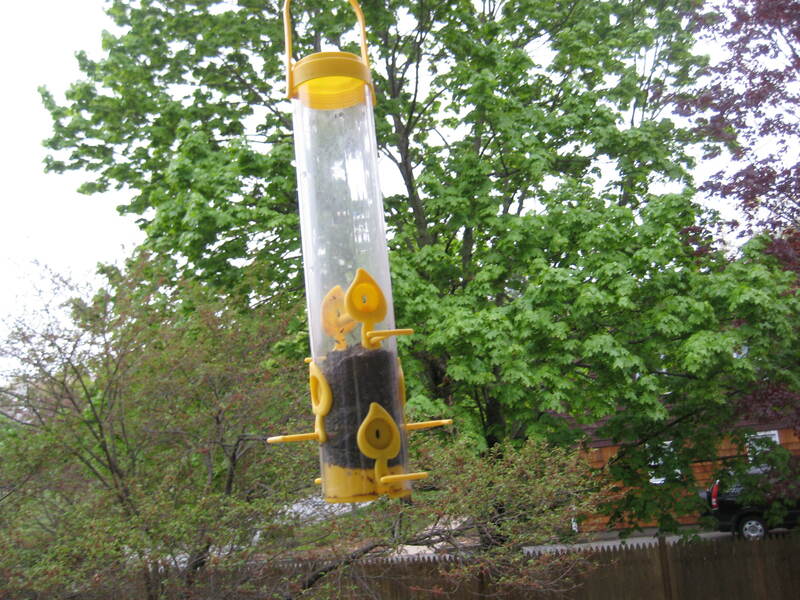 Thrilled with my purchases of: a new super-duper birdfeeder for the back deck; a yellow feeder designed for yellow finches; a simple birdhouse for viewing birds outside the kitchen window and a couple of hummingbird feeders – I hung them all and waited for the birds. They came, and I’ve enjoyed them more than a tablet (which I got for Christmas). This morning I was reminded of this unexpected purchase as I watched this spring’s first yellow finches arrive at the feeder on my front porch. This was a new birdfeeder. I had to switch to this feeder from the previous one, as its predecessor was defective. The openings on the defective feeder were not set up correctly, and birdseed spilled out of them as fast as I could pour it in. I tried several times, thinking perhaps I was pouring it wrong – but alas, it just kept falling out onto the porch, yard and every inch of the surrounding area. The spilled birdseed left a pile of mess. Our lives can at times be like this birdfeeder. Due to losses, rejection, unresolved issues from our pasts or simply a failure to seek God first… we can have “holes” in our inner selves that keep us from being “filled up”. We can try to fill this void with all kinds of accomplishments, relationships, things or just plain sin. Nothing seem to keep us filled… so we try again and again to fill ourselves up, only to be left with a mess. This is an amazing claim and promise from Jesus, that I have found true in my life again and again. It is a relationship with Jesus that makes my deep down soul complete. Everything else with which I try to fill my life just falls out of the holes…and leaves a mess. I love this water of life.